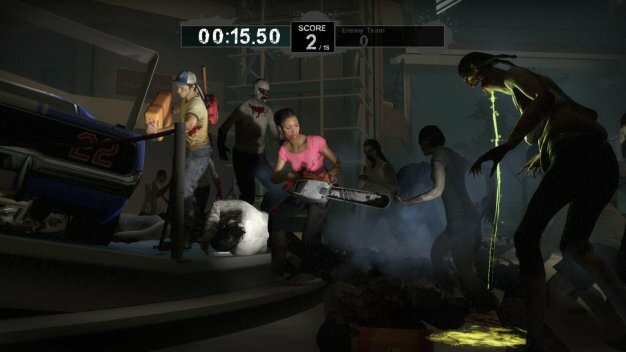 The recent release of the Crash Course DLC has us playing a lot more Left 4 Dead lately and one thing we’ve been thinking is how fun Survival mode would be if people could play as the infected. That dream will kind of come true with the release of Left 4 Dead 2 and its newly revealed multiplayer mode, Scavenge. The new mode pits the survivors in a race to get as many gas cans as they can to fill up a generator. Meanwhile, players controlling the special infected will attempt to prevent the survivors from achieving their goal. Each round will have a total of 16 gas cans that can explode if shot accidentally or on purpose for that matter. Players also have to be extra cautious and not allow the special infected destroy them. There are six maps set up for Scavenge mode and each match consists of three rounds each, best out of the three rounds takes home the bragging rights. We don’t know about you but for us the more we hear about Left 4 Dead 2 the more we cannot wait to get our hands on it. This Scavenge mode sounds like an insane and hectic version of Versus with a little bit of Survival mode sprinkled on top, which just has to be an awesome combination.